Concern about the carbon tax appears to be undermining consumer confidence. 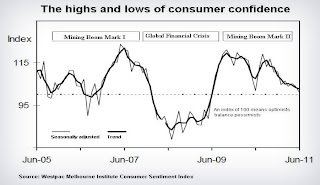 The Westpac Melbourne Institute sentiment index slid to its lowest level in two years yesterday hitting a low last seen in the global financial crisis. Confidence about personal family finances slumped lower than in the crisis. Asked what type of news they remembered hearing in the last month an extraordinary 44 per cent of those surveyed mentioned “budget and taxation”, almost twice the number who remembered hearing about interest rates and eight times the number who remembered hearing about politics. At 101.2 the Westpac Melbourne Institute consumer sentiment is barely positive after slipping 2.6 per cent between May and June. Confidence about family finances and the economy has plummeted over the past year sliding from positive into negative. Mr Hassan said the carbon tax would be one of a number of issues weighing down on consumers - others would be high utility prices, interest rates and “the absense of any positive supports”. Experience with the GST suggested that as the nature of the carbon tax became clearer and the implimentation date approached confidence would rebound. 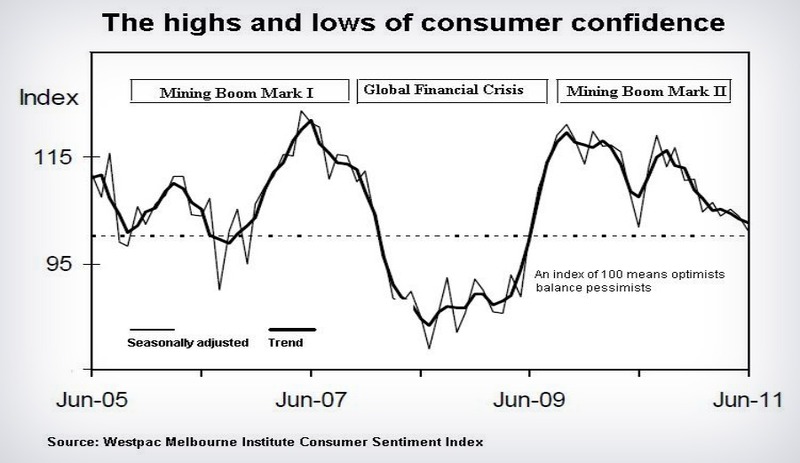 There was a big rebound in confidence two months before the introduction of the goods and services tax in 2000. A seperate Battle for the wallet report to be released today by TNS research finds two thirds of Australians believe the cost of living to be substantially higher than twelve months ago. Only one third have received a pay rise in the past twelve months. Reserve Bank governor Glenn Stevens told the economic society in Brisbane Wednesday his “central expectation” was that interest rates would have to rise “at some point” in order to contain inflation.